Twelve months; twelve holidays; twelve horror movies based on them. Add it up, and you get Into The Dark, an anthology produced by Blumhouse for Hulu. 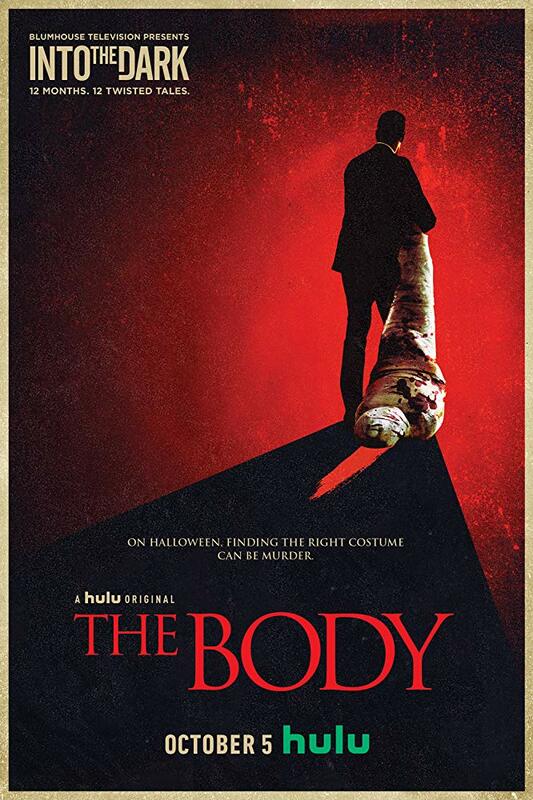 The series kicked off last October with The Body, a thriller which works well outside the confines of Halloween’s usual tropes. We follow Wilkes (Tom Bateman), a hitman who has just performed a contract kill, and, as he transports the plastic-wrapped body to the car, finds his tires slashed. While mulling over what to do next, a group of partygoers spots him and compliments him on what they perceive to be his costume and prop. They agree to give Wilkes a ride to his next destination, on the condition he will accompany them to a party for a quick drink. Wilkes acquiesces, and, unsurprisingly, things deteriorate from there. The content of the package is revealed and subsequently lost; the group (sans a girl who is fascinated with Wilkes’s profession) runs off, and the chase begins. This isn’t the type of movie cinema blockbusters are made of, and as Blumhouse is raking in cash and Oscars with the likes of Get Out and Whiplash, it makes sense to put lower budget fare into an anthology like Into The Dark. I doubt people would have lined up around the block to watch The Body, but I can see it becoming a sleeper cult hit on Hulu. It’s laudable, really: only ten years ago, The Body would have struggled to find a direct to video distribution deal. These days, thanks to streaming, studios seem more willing to take chances on offbeat films, and experiments like Into The Dark exposes the audience at large to a broader array of movies. The Body was co-written by Paul Fischer (the author of the fascinating A Kim Jung-Il Production) and Paul Davis, and the script is solid. Particularly Wilkes and his admirer are well fleshed out characters, and their dialogue is captivating. Wilkes might have a warped view on society, but he is almost convincing in using it to justify his actions. I’m guessing the film’s budget was limited, but Davis, who also serves as director, works with what he’s got, and The Body has a clean, concise look. The cast delivers a commendable performance, and I’d put The Body in the higher tier of V.O.D. movies. It’s an entertaining watch. Into The Dark kicks off on a high note, then, and I plan to sit through everything it has to offer. I doubt it all will be of the The Body’s pedigree, but I’m all about being proven wrong.